On its 4th year anniversary in the Philippines, OPPO, the No.2 international brand in the country, is delighting all customers with the last wave of the OPPO4U Anniversary Sale. The highly competitive and well-received OPPO F7 is now more affordable at PHP 14,990, giving customers PHP 3,000 in savings. The OPPO F7 offers the best selfie experience with its 25MP Sony IMX576 front camera, assisted with A.I. Beauty Technology 2.0 and Sensor HDR. Featuring a big 6.23” FHD+ Super Full Screen display for an immersive visual experience, the OPPO F7 comes together in a beautifully packaged, unique body design in colors of Solar Red, Moonlight Silver, and Diamond Black. Highly praised by the local media, the OPPO F7 is powered by the game-changing Helio P60 Octa-Core processor with dedicated dual AI processing cores for the latest functionalities such as Artificial Intelligence in photography, performance, and battery management. It delivers flagship-class performance at a mid-range price point, giving ultimate value for money. It is also powerful in multi-tasking with dedicated 4GB RAM and ample 64GB storage for photos, videos, and even applications. 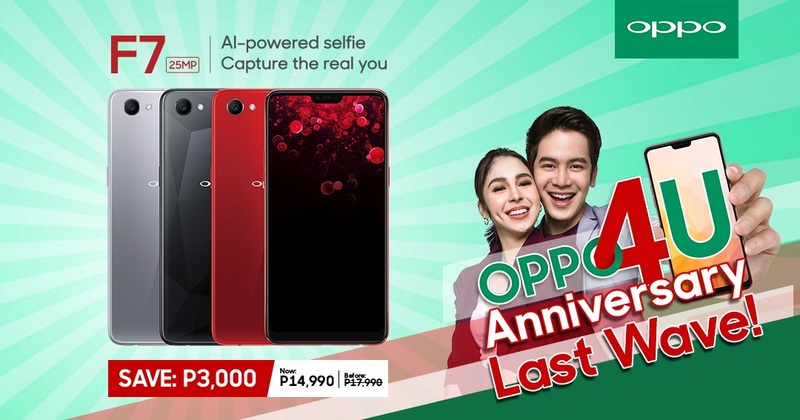 Customers who will avail until July 31, 2018 will be able to maximize the OPPO4U Anniversary Sale offering with 18 months total warranty, 20% discount on Olike accessories, and even a chance to win PHP 100,000 or even an Asian trip for two. Visit https://www.oppo.com/ph/smartphone-f7 for more information about the OPPO F7. You may also try OPPO stores nationwide and online shopping partners such as Lazada, Shopee, Argomall, Akulaku to avail of the latest offerings of OPPO. Additionally, the F7 is also available via Home Credit at six or nine months with 0% interest financing.